In the new heading appeared on the Foundation website, "Iz mog ugla (bs)" , the first personal "work (bs)"  is written by the graduate engineer Goran Cakic. 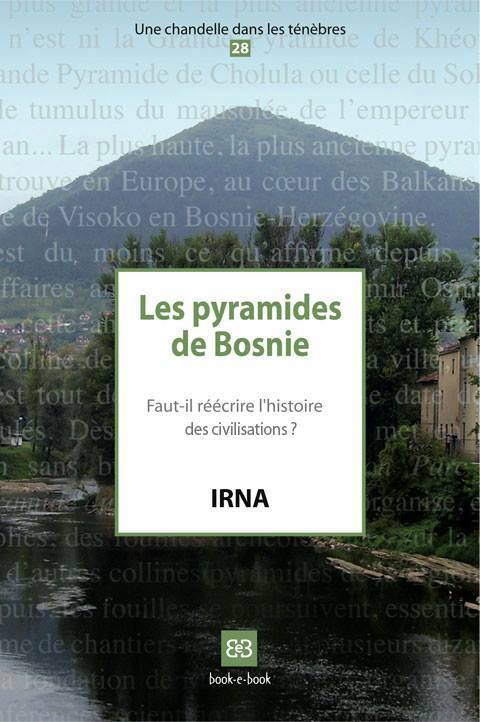 The text is in Bosnian - and I doubt that it will ever be translated in another language - but I’ll try here to give a rough idea of its content. The title is "Kako je moglo nastati ovo sto imamo i kako mi to gledamo danas, poslije 100 dana radova", or: "How could have originated what we have here, and how do we consider it today, after 100 days of work". It is about, as the title says, giving a progress report about the "pyramid-shaped objects" - so, we do not talk anymore of pyramids? - and about the possible origin of these "objects". The civilization that built these "arks" was, according to Mr. Cakic, really advanced: not only did they know the calendar, a fact which allowed them to forecast the changes of the weather (? ), but they also knew how to foresee the long term climatic events (by the way of the moves of the celestial bodies) and the consequences of the Earth tilting toward the Sun (I guess these consequences could be the seasons (en), as they are caused by the tilt of the Earth rotational axis in relation to the ecliptic (en)?). They also knew the celestial North and the magnetic North, a fact which can be deduced from the orientation of Visocica toward the celestial North; as well as the changes in the "magnetic flux" and the "movements of the magnetic tension fields". Their pyramids are of an extraordinary conception: not only did they use extremely resistant materials (180 KiloPascal, says the author - but whence this figure? the ones published by the Foundation are more near to 40 MegaPascal...), but they have also set these materials in real "sandwiches" where each layer plays an essential part (for the drainage, the stability, and so on). Imagine, there are even permeable layers, so that the water can go in and out of the structure! Let’s go back to the flood: there is the water slowly rising, but the valley inhabitants are ready; regularly, from year to year, maybe from generation to generation, they add a new "layer", always inclined about 5 degrees toward the inside of the hill, sometimes they even have to compete with the water which rises too swiftly. They are living on this platform of different size according to the season as it is well known that the sea level varies during the year (later in the text the author explains that the sea level was rising during spring and fall), and are always ready to add in a hurry a new layer as soon as the water level rises again. Till when? evidently, till the "arks" have reached their present height: the author explains that "the only thing that we know with absolute certainty is that the construction of these objects finished at a moment when there was in the valley 250 to 300 meters of water". Another evidence of this fact are the "prehistoric rings" (of which one, we are said, was found in the Visoko valley), rings that were used to tie the boats transporting the materials for the construction of the "pyramid-shaped objects" (see the appendix in Mr. Osmanagic’s book for these prehistoric iron rings). Let’s pass over the problem of the "objects" datation, based on the thickness of the soils, which give, with no surprise, an age of 10 to 12 thousand years; which makes our author say that it is useless that archaeologists "lose their time looking for C14 datable objects", when "geology" itself has given the basis of the datation... And let’s come back to the "pyramid of the Sun": the author notices that it is made as if the builders had wanted to "isolate" it from the outside. What was there, around Visocica? salted water. What did the builders try to "isolate" inside Visocica? fresh water. Fresh water that had to be protected from the salted water infiltrations, as well, according to the author, as from the water coming from the melting ice contaminated by acids and ashes from the eruption of a "mega-volcano" that took place 65 000 years ago (?). I’ll pass over the presence of fluorine, over some "uncanny" odors, and over the supposed presence of oil, I must admit that at this point I began to lose the thread of the author’s logic. One can first notice that the author uses a vocabulary that he evidently does not really understand: "litolitski" for "litoloski" (that would be equivalent to replace "lithological" by a strange "litholithical"); confusion between KPa (KiloPascal) and MPa (MegaPascal); he uses a number of "magical formulas", probably aimed at giving an illusion of scientificity ("geologically speaking", "transgression process", "structural-tectonical"...). He shows, as, by the way, all the non-scientific members of the Foundation, a total incomprehension of the nature of the sedimentary rocks that form the Visoko region hills, see this article about the bases of the region geology. Last, his basic postulate (the rising of the waters to 250 or 300 meters in the Visoko valley) is totally absurd. Let’s give a few basic data: the Visoko region is emerged since the end of the Tertiary Era (Upper Miocene), and the sea never covered the region since several millions years (the last layers deposited in Miocene have been deposited in a lake, and there are no trace of marine sediments). It is true that each interglacial creates what is called transgression (en) (a more or less important rise of the sea level caused by the melting of the ice sheets (en)); then there is a regression (lowering of the sea level) when a new glacial period begins. However, the last transgression (called in Europe flandrian transgression) caused a level rising of about 120 meters, and ended at the present level (0 meter), and there has been no regression after it, that means that the sea level has never been higher than today in the last 20 000 years, and surely never high enough to reach Visoko which is more than 400 meters high. In a few regions, where the thickness of the ice sheet was very important (like Scandinavia), the melting of the ice can have caused a slight rise of the continent (called "isostatic" or "post-glacial rebound" (en)), and consequently a relative lowering of the sea level, but never in Bosnia, which was not covered by an ice sheet! Another cause of violent floods exists in some regions with important glaciers: in some cases there is the formation of a moraine dammed lake (en), and the rupture of the dam can provoke a castrophic flood (en) as some are known in Alaska or Iceland. But there again, this hypothesis (which, what is more, does not match Mr. Cakic’s description of a slow rising of the water) cannot apply to Bosnia, which had a few small glaciers and névés, but nothing that can be compared with the glaciers of the two above cited regions. In short, how can one qualify this text, other than the "delirium" of one who would benefit in a few basic geology lessons? That could be translated as "From my corner", "From my point of view": there are gathered several "personal" writings by various members or friends of the team, among which some are, at the very least, somewhat delirious... However whimsical these writings are, one can deem that the Foundation "assumes" them in a way, by publishing them on its website - at a time, a "call for scientific contributions" intended for this part of the website was even visible on the home page.